We have quite an obsession with hummus in this house. I usually make a batch every week. And our consumption has increased since a certain Farm Baby discovered hummus. She loves the stuff! Since food is such an important part of our life, it is something that we spent a lot of time talking about how we wanted to create an environment that was food loving and a kid that would eat what we eat. 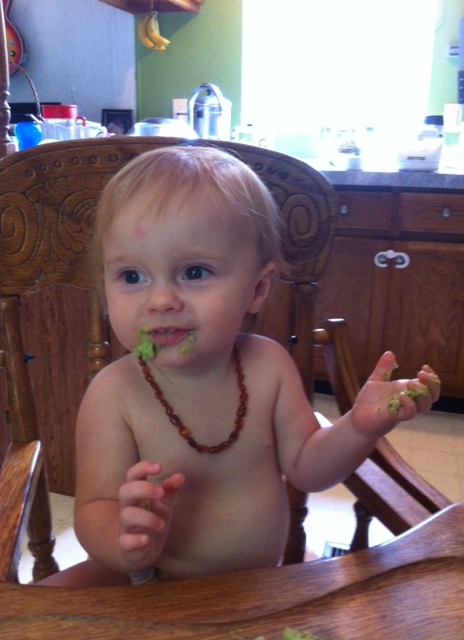 Once Farm Baby was ready for solids, we decided to start from that point, let her eat what we are eating. Let her see the direct connect between what we put in our mouths and what goes in hers. Chicken for dinner? Let her gnaw on a chicken bone. Broccoli? Let a couple extra-big stalks steam for a few minutes longer so that she can pick them up and easily “chew” some off. You get the point. Anyways, 13 months in and so far very successful. She eats what we eat, we don’t make a separate baby meal, we try not to fuss over how much she eats or if she doesn’t eat what we put in front of her, but most importantly, we let her have food choices. We offer her a variety of foods and let her decide the pace and what she wants to eat (by not spoon-feeding/forcing food)…OK, end side note (if you want more information on this whole skipping purees & babies eating real food madness, check out “Baby-Led Weaning”). 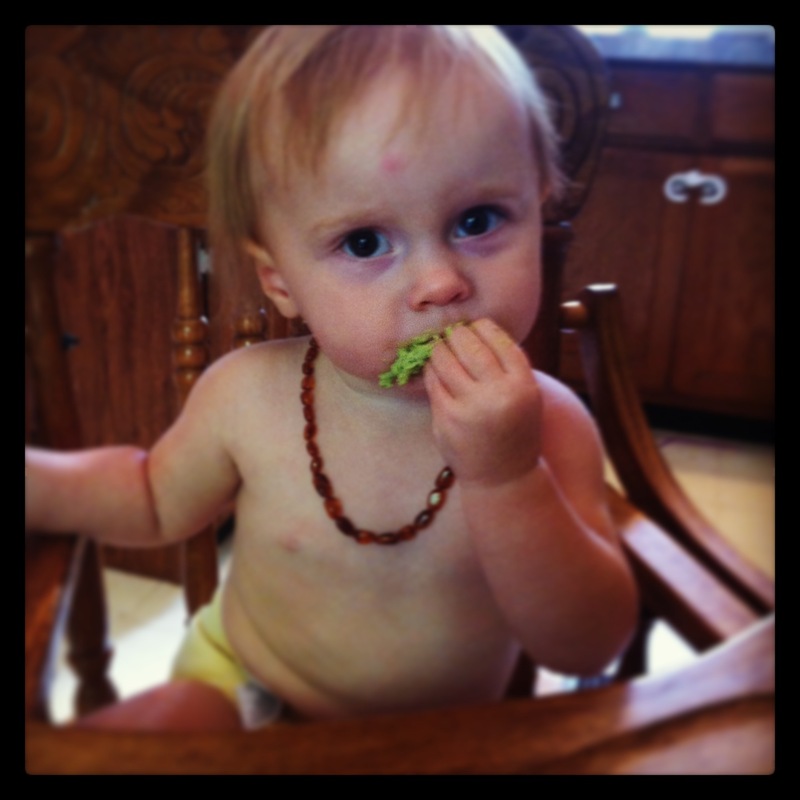 Back to hummus: Anyways, one of the tough things to get a baby to eat is greens…from a logistical standpoint. They don’t make great finger foods. She recently started drinking some morning smoothies, which I usually make green and add spinach, kale, arugula…whatever is in the fridge for added nutrition. She LOVES them. Win. And then, I came across this gem of a blog and recipe. Genius for not only sneaking more greens into an adult diet, but also brilliant for a babe that shovels hummus in by the fistful. I already had some chickpeas on the stove simmering and had kale in the fridge when I came across it. So I made it instantly with a few changes as I didn’t have the patience to roast garlic at the moment. I can’t wait to make another batch and try it with roasted garlic! 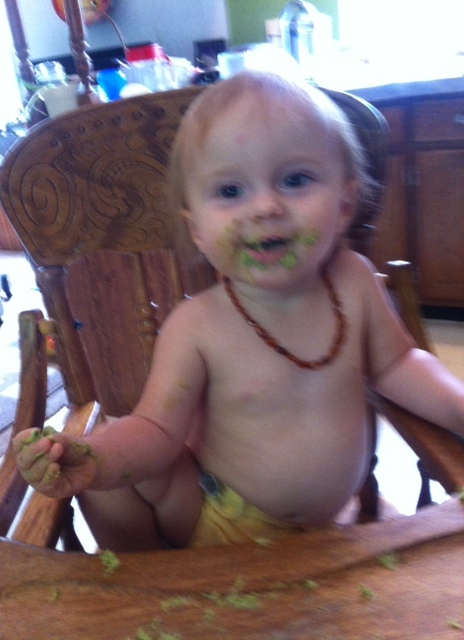 Enjoy watching Farm Baby discover bright green yummy hummus! I hope this inspires you to add some greens into your hummus! First bite…not too sure about this, Ma. Not so bad, I kinda liked it! Okay, I loved it so much I smeared it all over my face, belly, and even added some green highlights to my strawberry blonde locks! Place all ingredients in food processor and process until combined. You may need to scrape down the sides/add more liquid to suit your needs. *I prefer freshly cooked chickpeas. I soak my beans overnight in water (8-12 hours). Drain, fill with filtered water so that beans are covered and cook. Depending on freshness of beans and how long you soaked this can take anywhere from 25-60 minutes. If you are doing this method, reserve some cooking liquid to use in the recipe, you will need about 1/4 – 1/2 cup. ** If using freshly cooked beans, you will need a good amount of salt. Start at a teaspoon and keep adjusting, tasting along the way. I think I used close to 1 1/2-2 tspn. Do you use curly kale? I have a bunch of dinosaur kale, but I’ve never cooked with it. I hear it tastes different than the curly leaf. You can use either! I had some purple curly on hand, but I love and mostly prefer dinosaur/tuscan/lacinato. The best thing to do with that is make chips though since they are already flat. I also love making slaw/raw salads using dinosaur as I do like their taste best raw.